Another great cooking method to take your turkey flavors to another level is to cook a Smoked Turkey. Cooking a turkey on a smoker will take longer than traditional oven roasting, but the smoky flavor results in the delicious and tender turkey meat. Do not let the darkened look of the turkey skin throw you off, because when you cut into the finished turkey it will be moist and juicy inside! Your guests will be begging to take some leftover turkey home. Smoking a turkey is no different from barbecuing in your back yard. You follow all these rules without even noticing them in most cases – so go ahead and give smoked turkey a try. You will not be dissatisfied when you try a smoked turkey. Follow the safety rules without deviation and you will have the best turkey you have ever had. If you do not have time to wait for 6 to 8 hours to wait for a turkey to cook, or you have went and bought a 300-pound turkey to impress your in-laws, just take it and cut it up like you would a chicken and it will cook twice as fast and taste just as good. Step One: The absolute first step in cooking a turkey on a smoker is to pick out a bird (turkey) that is not the biggest one you can find. The main reason for a smaller bird (10 to 14 pound maximum), is the time limitations usually involved. It takes between 6 and 8 hours to smoke a 12-pound turkey and the bigger they get, the longer they take. Step Two: Set up the smoker and toss on the bird. When using charcoal, it is best to let the flames burn out first, fill the water pan with water (seasoned water is fine too), then place the lid on the smoker and wait for the temperature to reach the safe zone on your smoker. Once that is accomplished, toss the turkey on there gently and cover the smoker. Start timing the turkey when the temperature returns to the save zone. Safety Reminder: Remember chickens and turkeys are prone to salmonella bacteria which can ruin your whole Thanksgiving. Cooking temperatures of 165 degrees F. minimum are essential for destroying this bacteria. This temperature is not the OUTSIDE of the turkey, but the INSIDE, so keep that in mind when you decide on a larger bird. This of course is unless you happen to be feeding the traditional army at Thanksgiving. Type of Smoker: I use a water Electric Smoker which by design keeps the meat moist and prevents burning like a traditional smoker with no water in the event you forget about the turkey for an extra half hour or so. Most smokers have two (2) racks or more, so just distribute the parts evenly on each rack. I feed a small army here at Thanksgiving and/or Christmas, so I generally cut it into pieces and smoke it that way, which does take about 1/2 the time. Smoked Turkey is not as pretty when it comes off the smoker, but the taste is still the same and the effort you put into it will impress even that mother-in-law that thinks you are still a thief for taking her daughter away from her. Now for those of you who have electric smokers and gas smokers, I am not sure of cooking times, so follow your instructions that you have with your smoker. I am certain they take less time and might be just as good as a charcoal smoked turkey, but you would have to prove that to me before I would ever switch. Type of Charcoal Used: I have used inexpensive charcoal and the good stuff, and have found the main difference being the number of times you need to add charcoal. The better the charcoal, the longer between times you need to add it. You can expect to use 10 pounds or more of charcoal for a 10 to 14 pound turkey, so have some extra just in case. You will most likely not have to check the charcoal or temperature for 3 hours if you use good charcoal so this gives you time to watch a football game or two or be with the guests or just sit back and have an eggnog and brandy if you are so inclined. When you check the temperature on your smoker, just look at the gauge that is there. Most of them have a “safe” zone or a actual read out with numbers but in either case, keep that temperature above the safe” zone. Check the water after you add charcoal each time just to keep it full and not let it run out. If you happen to run out of water in the pan, add water carefully since if you spill on the charcoal, it will put off steam and it is not a pleasant feeling on your hands, arms or face. I use an old two liter bottle filled about 3/4 full of water and hold it from the bottom when adding it – this keeps you far enough away from the smoker and charcoal and in the even you happen to spill (which I usually do). It just sends the steam up in the air and away from you. It is also possible to use hickory chips or mesquite chips or other chips in your charcoal to flavor the bird. Soak them for at least one (1) hour in water and then toss them on the charcoal. They will smoke and add that flavor to your turkey. Temperature of Smoker and Smoked Turkey: I have never had a problem smoking turkeys, chickens, meats, or fish so just make sure of your temperature. When you add charcoal to the smoker, stir the ashes around and bring up the hot coal away from the ashes. This will help start the added charcoal faster and keep the temperature correct. Add plenty of charcoal at the beginning and when you add more, add as much as you can. That way you will not have to be going back and forth and adding a few pieces here and there. Just fill the pan up when you add charcoal – it is not important how much you use, but how hot the smoker stays. 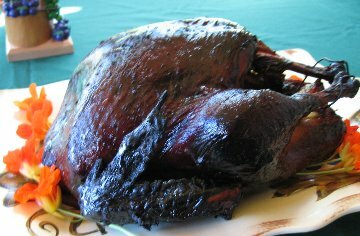 After about 5 hours, it is a good idea to actually take off the lid and check the condition of the smoked turkey. Remember – each time you remove the lid for those of you who are lookie loos, it adds between 10 and 15 minutes to the cook time, so do not take the lid off to see your prize until you absolutely have to. Taking the Smoked Turkey’s Internal Temperature – The USDA has come up with a one-temperature-suits-all for poultry safety: 165 to 170 degrees F. For safety and doneness, the internal temperature should be checked with a meat thermometer. It is important to use a meat thermometer with a cable attached to the meat probe tip. This will allow for the meat probe tip to stay in the turkey during the entire smoking and cooking process while the smoker lid is closed and give you a continuous temperature reading of the meat to ensure it does not overcook. I recommend using the Thermoworks Smoke Pro Series 2 Channel High Temp Cooking Probe for continuous monitoring of the meat’s internal temperature in addition to monitoring the smoker’s internal temperature during the smoking and cooking process. Includes wireless receiver to remotely monitor the temperatures from up to 300 feet away. To Take Temperature of Thigh – Place the thermometer in the thickest part of thigh away from the bone of the turkey to check the internal temperature at intervals during the cooking time. To Take Temperature of Breast – Insert thermometer at neck end, holding it parallel to the turkey. Confirm temperature by inserting thermometer in both sides of the turkey. Outdoor barbecuing or grilling is a very easy and efficient way to cook your Thanksgiving turkey. No mess in your oven or the kitchen. Your turkey will be crisp outside and juicy inside. This way of cooking your turkey is anything but greasy as the deep-frying process seals the outside and the turkey remains incredibly juicy, while the skin gets wonderfully crispy. This style of pit cooking is also know as “Bean Hold Cooking.” If you have the time and place to cook your holiday turkey in an outdoor pit, wouldn’t this make a great Thanksgiving or Christmas turkey dinner. It is hard to beat the classic roast turkey with the wonderful aromas that waft from the oven kicking off the anticipation for the holiday meal. Roasting a large turkey is one of easiest ways to accommodate a large crowd of family and friends. What the heck is that? Well it is a deboned turkey (except for wing bones and drumsticks), a fully hand deboned duck, and a fully hand deboned chicken, all rolled into one. I am not a vegetarian or a vegan, but I have several family members who are. For them and my many readers who are also vegetarians or vegans, I created this page on how to cook Tofurky. How to purchase, stuff, and roast a turkey – Choosing a fresh or frozen turkey – How to thaw a frozen turkey – How to prepare turkey for stuffing. Homemade gravy, made using the turkey giblet stock, pan drippings, and meat juices from the roast turkey, is an essential part of a traditional Thanksgiving dinner. This is the secret that chefs never tell you about. It is very easy and economical, and requires no special cookware. Brining is like a marinade, as it keeps food moist and tender. Don’t throw out those leftover turkey bones! My favorite thing to do the morning after Thanksgiving is to make homemade turkey stock from the turkey carcass. It is so easy to do and so delicious! Whether you call it “stuffing” or “dressing,” what’s not to love about turkey stuffing? Everyone knows that stuffing is the best part of a turkey dinner! Save your valuable kitchen time on Thanksgiving day by using this easy-to-make mashed potato dish for your next Thanksgiving dinner. This is the recipe I use every year for Thanksgiving Dinner. Have you ever cut into a turkey to see if it has finished cooking? You DEFINITELY need to use a cooking thermometer! A cooking thermometer or meat thermometer should not be a “sometime thing.” Use it every time you prepare foods like poultry, roasts, hams, casseroles, meat loaves and egg dishes. Cooking thermometers take the guesswork out of cooking, as they measure the internal temperatures of your cooked meat, poultry, seafood, baked goods, and/or casseroles, to assure that a safe temperature has been reached, harmful bacteria have been destroyed, and your food is cooked perfectly. Always follow internal cooking temperatures to be safe! Leftover” foods are cooked foods that you or your family do not eat within 2 hours after they are cooked. The chance of food poisoning increases the longer you store a food after it is cooked. Improper handling or storing cooked food is one of the most common causes of food poisoning in the home. I had a charcoal smoker (simple Brinkman) for a few years and it was absolutely the cat’s meow. This smoker got damaged and my wife ordered a new one for me – a Brinkman electric version this time. I was sure I would just hate it, but I was completely mistaken!! Four days is too long to keep a cooked turkey safely. Three (3) days would be the maximum. I suggest you cut the turkey, like you would on thanksgiving, and freeze the slices until ready to use. It is better to be safe than sorry! I have had both charcoal and I have electric now and love it faster and no different in taste I still use fruit trees in my electric smoker so give it a try you wont regret it. Question – Can re-use the brine in your water pan as the liquid in your water smoker? Since you may have apple cider and other spices in the brine- will this work? I wouldn’t recommend it. Start with fresh water in your smoker.